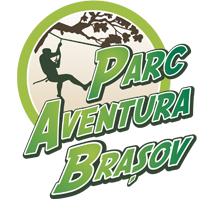 PARC AVENTURA DESCRIPTION We are waiting for you to Parc Aventura Brasov to exceed your limits!!! 2 red routes and 1 black route that requires energy, strength and technique, on this route we experience a maximum level of adrenaline. "Close your eyes and jump" - an independent game, climb the ladder from the ground, height 16 meters. You close your eyes and jump or you can just jump with your eyes wide open. Do you dare? The biggest height you can reach is on the black route and it is of 20 meters. Who dares? We are waiting for you to Parc Aventura Brasov to exceed your limits!! !